Comparing two similar vehicles can be tedious, which is why we took the guesswork out of it for you with this comparison of the Honda CR-V vs. the Toyota RAV4. Stay with us to see which of these vehicles has better interior space offerings and other impressive components as well. Without a doubt, the 2017 Honda CR-V shows up the 2017 Toyota RAV4 when it comes to interior space. The Honda CR-V starts with more readily available cargo space, with between 39.2 and 75.8 cubic feet of space. The RAV4 falls far behind with numbers only reaching between 38.4 and 73.4 cubic feet. 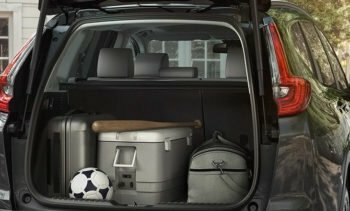 Passenger space on the CR-V totals 105.9 cubic feet, giving passengers plenty of room to relax, while the RAV4 comes up behind once again with a mere 101.9 cubic feet. The Honda CR-V is able to prove it has the upper hand in plenty of other areas as well. As far as pricing goes, the baseline CR-V LX 2WD is priced at $24,045 MSRP,* while the RAV4 costs over $1,000 more at $25,410 MSRP—an increase without reason since the CR-V provides more amenities than the RAV4. The CR-V is also able to provide impressive performance with an engine that delivers 184 hp and 180 lb-ft of torque and solid fuel efficiency. The RAV4 is much less powerful and efficient, delivering up to 176 hp, 172 lb-ft of torque, and lower fuel economy. The CR-V also keeps you safer with a perfect 5-star safety rating from the NHTSA. ** The RAV4 has a 4-star overall safety rating. Feel free to give us a call or visit our website to learn more about our current promotions and financing process, but the best way to get a feel for how great Honda’s vehicles are is in person. Visit us at your nearest West Michigan Honda Dealers location. We’re ready to help you find your new Honda!